I’m late, so late. 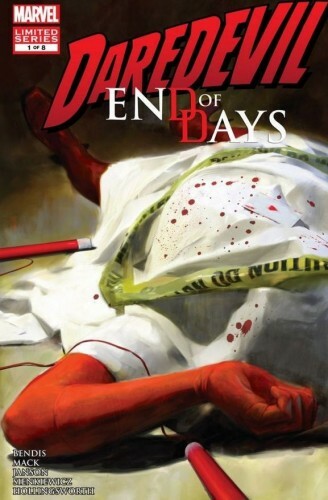 It was only because I had the opportunity to actually turn up in person to my comic shop of choice (I’m a mail order customer), that I stumbled across the Daredevil: End of Days mini-series. Slated for eight issues, four were already in store and the cover artwork had me picking them up right away. Sure, I’m a Daredevil completionist, so I would have grabbed them anyway, but after consuming the first issue it became apparent that this was going to be one of the best Daredevil story arcs in a lot of years. Even taking into account the recent superb Mark Waid run on the monthly title. I’ll get onto why I so rapt, but be aware there are spoilers, so stop reading here if that’s a concern and get out and buy these issues while they’re still on the shelves. 1. Sentimentality: if you lived through Frank Miller and Klaus Janson’s famous Daredevil run, the return of Elektra, The Kingpin and Bullseye to name three, is a hook hard to avoid. Add in to that the fact that Klaus Janson is doing pencils on End of Days and it becomes a no-brainer. Oh, and there’s also Typhoid Mary, Echo and The Punisher by end of issue #4. 2. Story: sometimes it seems that Brian Michael Bendis can do no wrong, and this series’ effort alongside David Mack is not going to dispel that perception at all. Using the veteran reporter Ben Urich as the narrator works superbly and the persona of an aging man in an ever-changing society is captured perfectly. Daredevil is dead a few pages into the first issue, so a good story becomes even more critical and it’s delivered in spades. 3. Art: aside from the sentimental aspect of Klaus Janson penciling this book, the whole art team have pulled off a supreme effort. It’s dark, gritty and engaging work. Bill Sienkiewicz’s finished art is of the quality I’d happily pay out big bucks for in a poster format. Take note please Marvel. Overall, Daredevil: End of Days is one of the best Marvel stories I’ve read in the past three years. If work of this quality was done across the board, there’d be a hell of a lot more people reading comics across the board. If you live near a comic shop, get your arse in there and see if they have the first bunch of issues. If not, buy them digitally or start the countdown to the trade – I think I might buy it to hand around to a few people to get them back into comics.